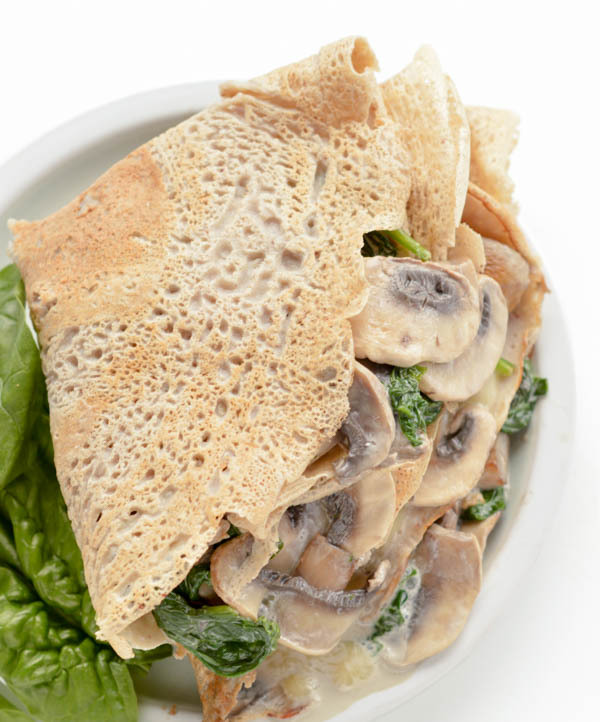 French Buckwheat Crepes are gluten free savory crepes made of 100% buckwheat flour, water, egg and salt. 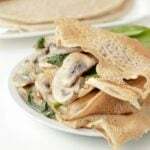 It is an easy and healthy 4 ingredients crepes recipe with moist center and crispy borders that French people love to eat for dinner stuffed with spinach and mushroom or ham and cheese. As a French I love crepes – there is not a week without making crepes in my house. I do any kind of crepes but my favorite are the authentic French crepes recipes – the sweet one made of white flour, eggs and milk – not the healthiest, right. However, the Savory French Galette or French buckwheat crepes are made of healthy buckwheat flour rich in fibre, protein and vitamin B. It is a super easy recipe to make – honestly, most French people make them without even following a recipe – just looking at the texture of the batter. 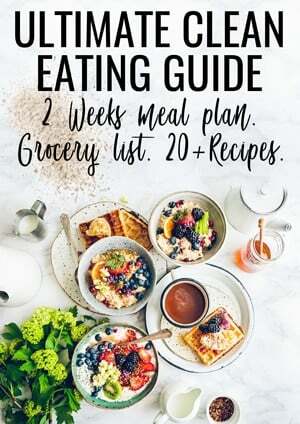 Egg – if you are vegan, you can easily use a flax egg substitute in this recipe – mix 1 tablespoon of flaxmeal in 3 tablespoons of water, stir and let sit for 15 minutes. 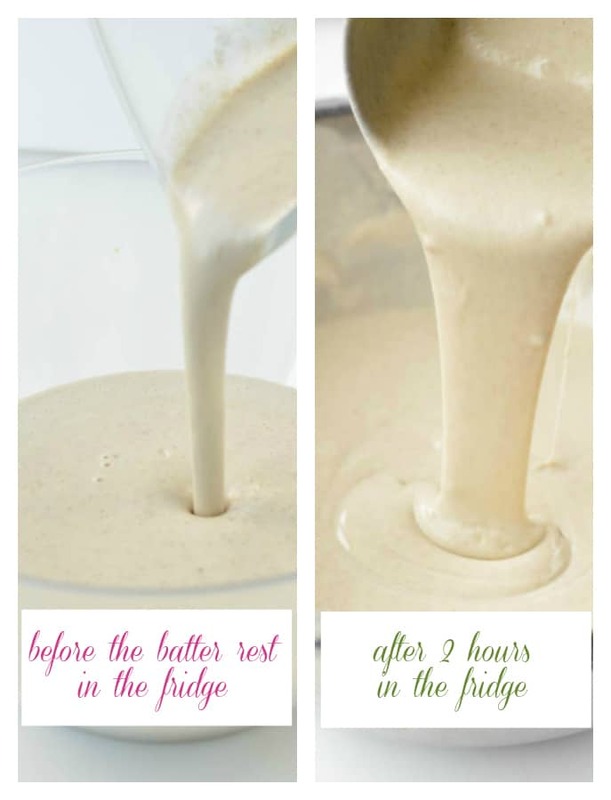 I used to make my batter in a mixing bowl an whisk it manually but I am now using my blender – much faster and I am sure there is no lumps in the batter. French people named the French Buckwheat crepes Galettes. While it is a very simple no fail recipe they are some tips to success in making a delicious French Buckwheat crepes. Let it sit at least 2 hours in the fridge to thicken – look at the two pictures below. When the batter rest in the fridge it thicken and get darker. It is a very important step to make beautiful golden crepes that are not chewy but moist with crispy sides. The best is either to let it rest overnight in the fridge. The first crepes is a test one ! Any French people discard the first buckwheat crepes – sort of tradition. It is always a ugly one, either too thick – batter did not spread well because you did not add up enough water after it sits in the fridge or the crepe is too white – the pan wasn’t hot enough etc. The batter is not perfect at first time and that is ok.
Making crepes is easy – making beautiful evenly thick crepes is an ART. It takes time and practice to learn how to quickly tilt the pan, how to grease, warm the pan, but the good news is a crepe ALWAYS taste good whatever how bad they could look! My husband is French, he makes the most delicious ugly crepes 🙂 That is what I love about crepes. Anyone can make a delicious crepe. How an authentic buckwheat French crepes looks like ? 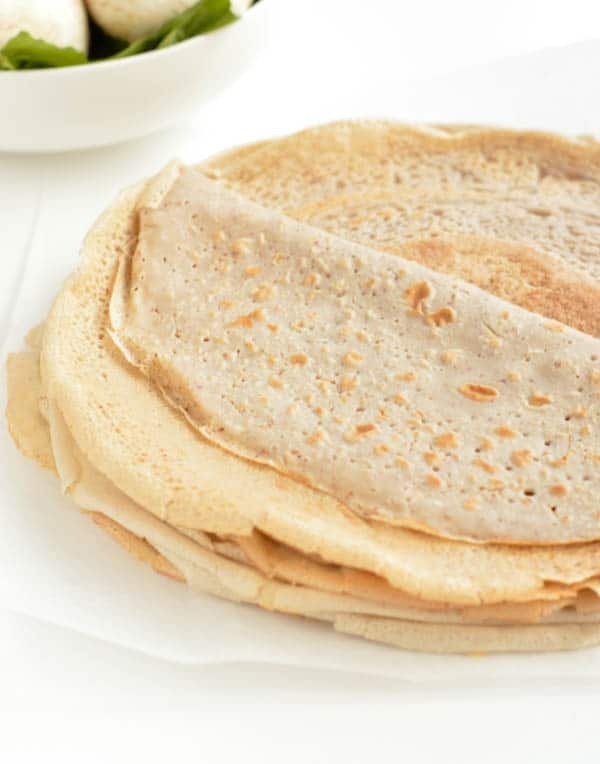 A beautiful buckwheat crepes is moist, slightly chewy in the centre with some small holes all other the crepe. The first side you cook on the pan as circle brown shapes while the other sides as little brown dots. Place the crepe on the crepe pan and garnish HALF of the crepes with layers of grated, cheese, ham, cooked potatoes or vegetables, more grated cheese. Cook AGAIN ON BOTH SIDES until golden and crispy ! Below I shared my vegan spinach mushroom crepes pictures made with coconut cream. Recipe coming soon on the blog ! 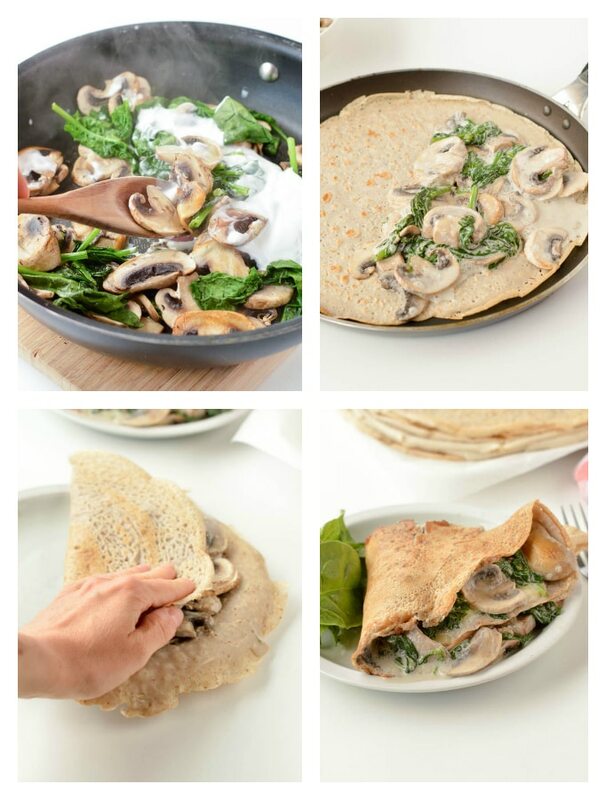 Watch the recipe video and make those French Buckwheat crepes now ! 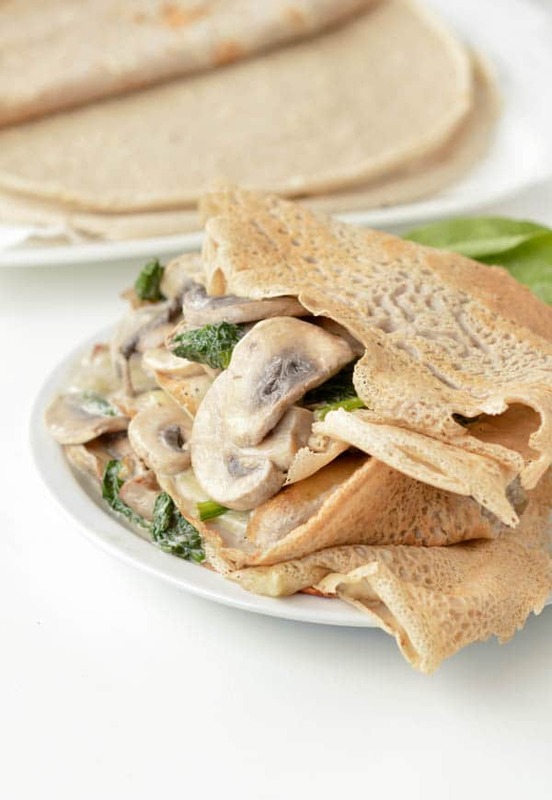 French Buckwheat Crepes are gluten free savory crepes made of 100% buckwheat flour. An easy, healthy 4 ingredients savory crepes recipe to stuff with ham and cheese or spinach and mushrooms. In a blender add the buckwheat flour, water, egg, salt. 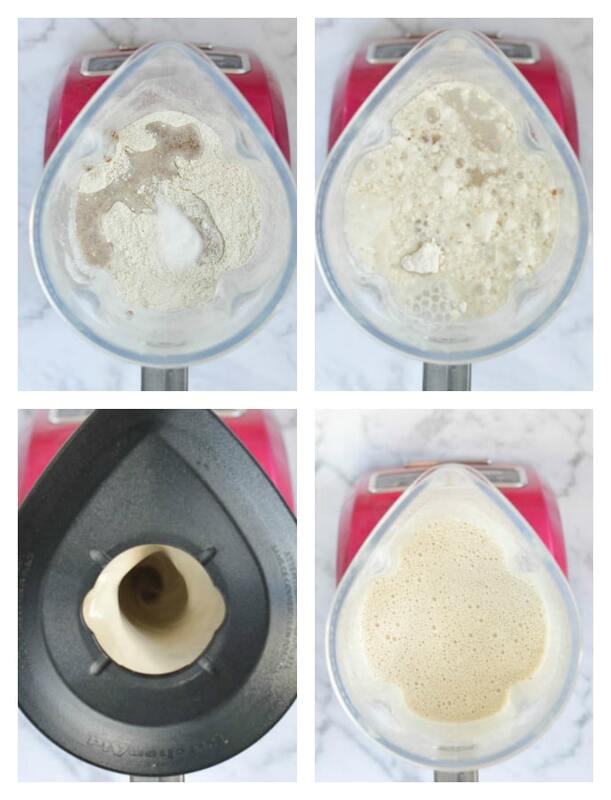 Blend for 30 seconds or until smooth. If you don't have a blender, use a large mixing bowl. Add buckwheat flour, egg, salt and beat in the water gradually until a smooth batter form with no lumps. Heat a lightly oiled crepes pan over medium/high heat. I use a piece of absorbent with a 1/4 teaspoon of coconut oil (or butter) on it. Rub the paper on the pan to slightly grease the pan. 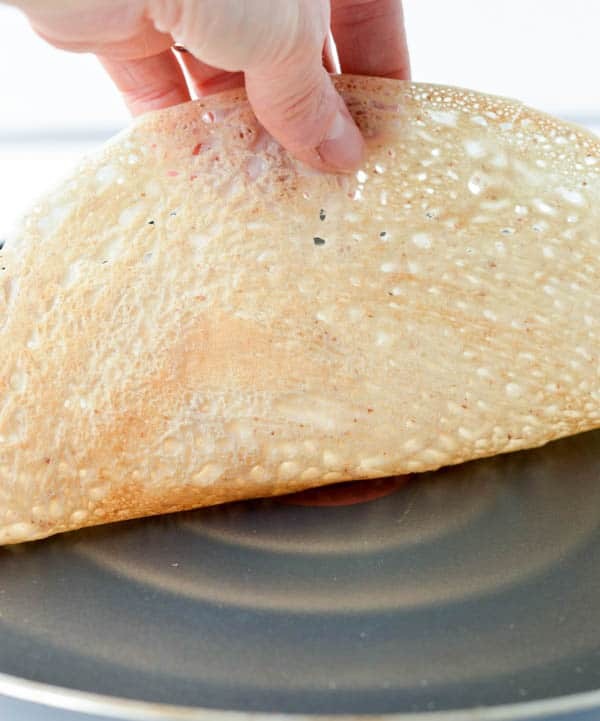 Make a first crepe to test your batter consistency. Pour or scoop about 1/3 cup batter onto the pan, then tip and rotate the pan to spread batter as thinly as possible. Keep in mind that a authentic French buckwheat crepes is thicker than a regular French crepes. and it does not spread as well. If it is difficult to spread add a bit more water in the batter - up to 1/3 cup. French people always discard their first crepes! In a pan, under medium heat, warm olive oil then add the shallots. Stir for 1-2 minutes until fragrant. Add the sliced button mushroom all at once, stir and cook for 5-8 minutes until fried on all sides until they begin to brown. Stir in the dried oregano, nutmeg, garlic, salt and pepper if you like. Stir in the spinach. Cover with a lid and cook until just wilted - 1 or 2 minutes. Uncover and stir in the canned coconut cream. Simmer 2-3 minutes. How to eat French Buckwheat crepes as French people do ! Place the crepes in the pan - first side you cooked on the pan. Garnish half the crepe with grated cheese, spinach mushrooms filling more cheese and close the crepe. Cook 1-2 minutes on both sides until brown, crispy and cheese is melted. You can omit the cheese , if you are vegan or use vegan dairy free cheese. Make it Vegan: My huband and I are vegan since May 2017, we replace the egg in this recipe by a flax egg. Simply combine 1 tablespoon of flax meal with 3 tablespoons of water. Sit for 15 minutes. Add in the batter as a egg. We use vegan cheese or no cheese at all in the filling. The vegan recipe usually don't need to add extra water after the batter sit 2 hours in the fridge, the consistency is spreading well and the crepes hold perfectly together. Nutrition panel is for one french buckwheat crepe without filling using one egg. This recipe makes 6 crepes. Nutrition panel is for one french vegan buckwheat crepe without filling using one flaxegg. This recipe makes 6 crepes. Hi Carine, I’m just wondering, do you not find the coconut cream too sweet for this savoury filling? Is there any other milk/cream I could use. Maybe cashew? These look so yummy! I want to make them! Hello! Well, I am kinda coconut addict 🙂 So no, I think it taste amazing! But I undrestand what you mean and other great option could be cashew cream of course or a reamy cauliflower sauce ! Super yum in savory crepes! Thanks for following the blog and trying the recipes. Let me know f you make it with a different filling. It is always great to have more idea for my next crepe party ! XOXO Carine. Thanks for the great recipe. I used 300 g whole buckwheat groats and ground them to a flour in my Vitamix. It worked great. Amazing! You are talented, I never thought about making my own buckwheat flour from the groats, so clever! Thanks for sharing. Enjoy the healthy recipes on the blog. XOXO Carine. If I don’t have a crepe pan, can I use a normal pan? Yes sure, make sure you use non stick pan or it will stick to you pan. Or use a pancake griddle. Enjoy ! XOXO Carine. Why not almond milk instead of water?